Louis Weidner. Courtesy of Sandy Weidner-Menne, Laporte, Indiana. [S7] St. Mary Catholic Church, St. Mary's School Dedication, 138. [S357] O.F.M. Father Ambrose German, Herchenbach Family History, The, 55. [S361] Platte Valley Kinseekers, Platte County Nebraska Marriages Book 4, 1889 - 1893, 43. [S368] Platte Valley Kinseekers, Platte County Marriages Book 11, 12 April 1916 through 29 June 1919, 24, 56, 58. [S369] Platte Valley Kinseekers, Platte County Marriages Book 12, 28 June through 22 March 1922, 37. [S11] John J. Weidner, Compiled Birth, Death, 599. 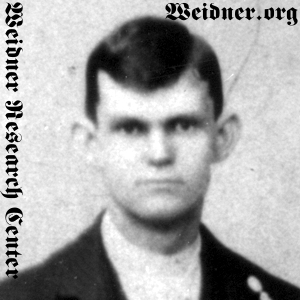 [S11] John J. Weidner, Compiled Birth, Death, 599 date only. [S361] Platte Valley Kinseekers, Platte County Nebraska Marriages Book 4, 1889 - 1893, 43 state only. [S858] Lori, Mikayla & Kristin Beller Beller, Ferdinand and Agnes Weidner Family Reunion July 3, 2005, unpaginated, 3rd page, death date only. [S368] Platte Valley Kinseekers, Platte County Marriages Book 11, 12 April 1916 through 29 June 1919, 24. [S368] Platte Valley Kinseekers, Platte County Marriages Book 11, 12 April 1916 through 29 June 1919, 56.